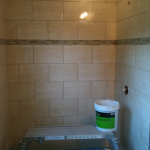 I was contacted by a client in Wesley Chapel, Florida which is just North of New Tampa to do a master bathroom tile remodel. 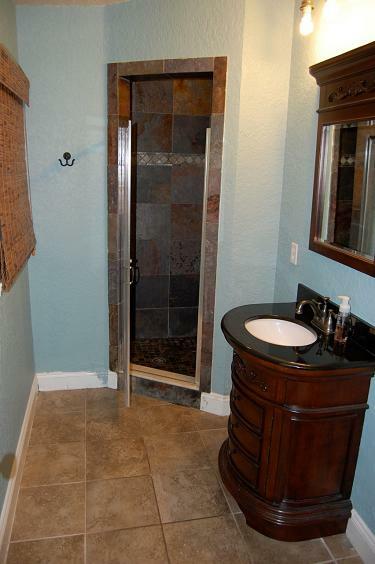 They had just purchased the house and didn’t like the existing bathroom and also told me they thought there were problems with the shower. 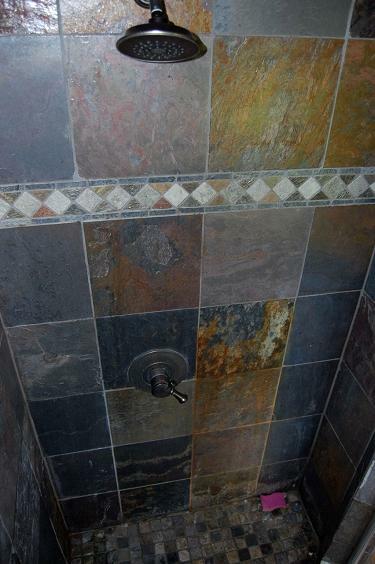 They decided they wanted to redo the bathroom tile to something they liked rather then the slate tile that was there now. 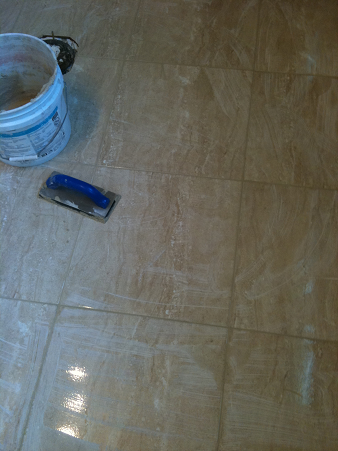 I first sent them out to one of my tile distributors showrooms I use in Tampa and had them meet with my salesperson. 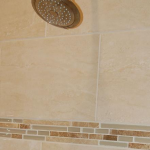 I wanted them to select a tile for the shower walls, shower floor and the main floor and also select a grout color they liked. 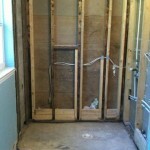 Once that was done I would set up an estimate and head out to their home and do a measurement and look at the project. 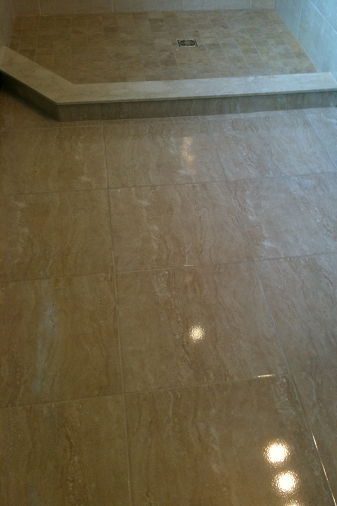 A week later they went to the showroom and met my sales rep and selected tile. 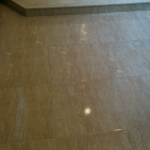 They selected a nice 10×16 glazed porcelain tile that looks like a serpeggiante travertine tile. 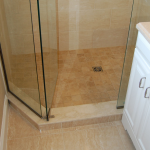 They also selected a glass and marble accent of tan glass and light emperador along with a matching 3×3 porcelain tile for the shower floor. 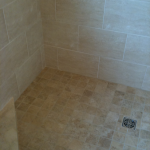 For the main floor area they selected the wall tile matching 18×18 tile. 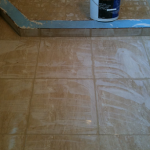 While they were there I had them select a marble sill for the shower curb. 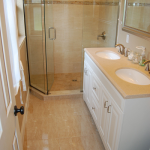 When I got to the house and I walked into the bathroom I could definitely tell they had problems and it needed to be re-done. 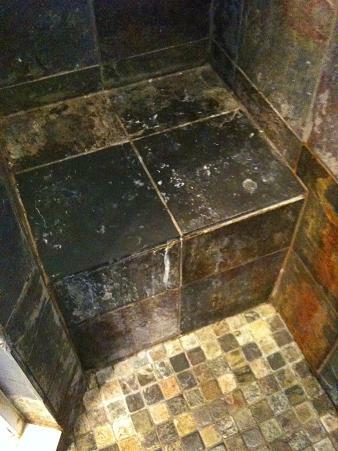 It was an enclosed cave type shower that the previous owner had redone some years back with slate. 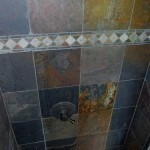 The slate had rust and mineral deposits coming out of some of the tile and it was running down the face. 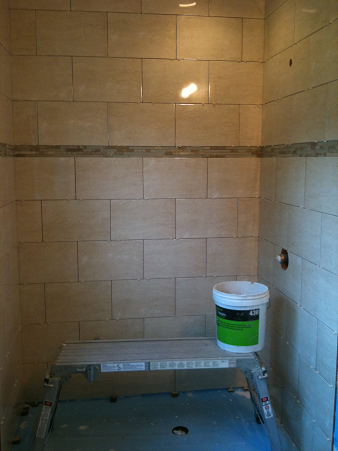 The ceiling had some mold on it and there was mold coming out some of the grout joints and cracks in the grout. 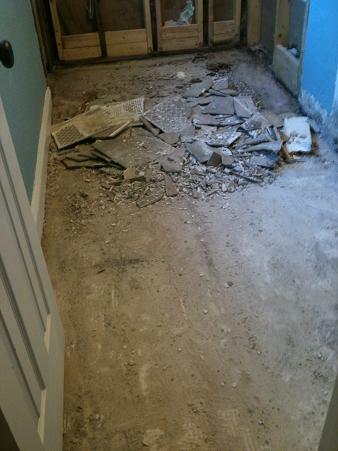 There was also serious rot on the wood baseboard and wall outside of the shower. So you know its pretty bad and has problems. 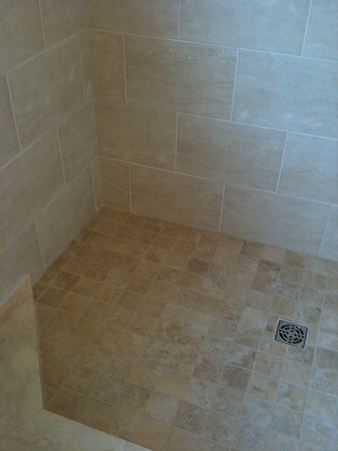 After I took the measurements and a made notes of problems I gave them my assessment of the shower. With all of the problems I told them that were happening in the shower they asked me to just give them a price for a full rip out and replace. I worked up a proposal for them a few days later after getting prices on the tile they selected, calculating the total square footage of tile needed, waterproofing and other materials. 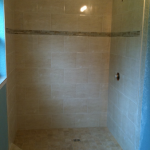 They were anxious to get rid of the shower and start on a new one so they eagerly accepted my proposal and gave me the deposit to start. 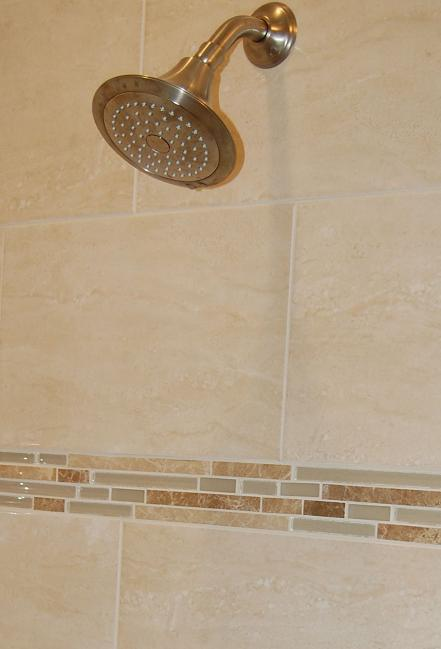 I placed the tile order as soon as possible to get the project going and had them expedite any items that weren’t in stock. 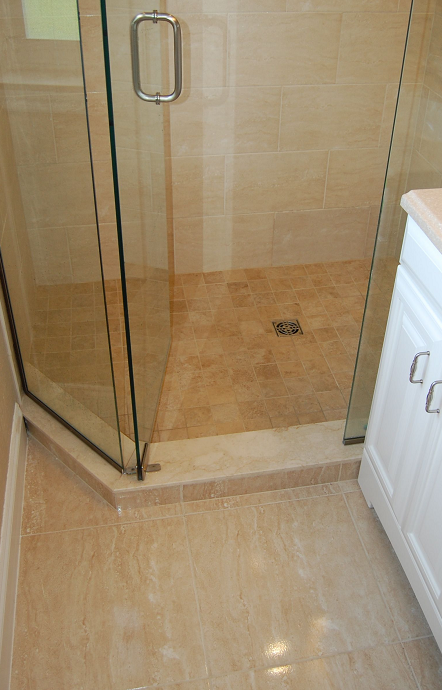 Most of the tile was in stock except for the glass and marble accent which were shipped in a few day. 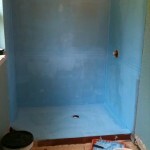 The day we started the project I was ready and expecting the worst knowing the shower had to be a moldy mess. 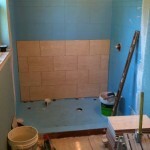 Once we started ripping out tile I could tell the shower was constructed wrong. 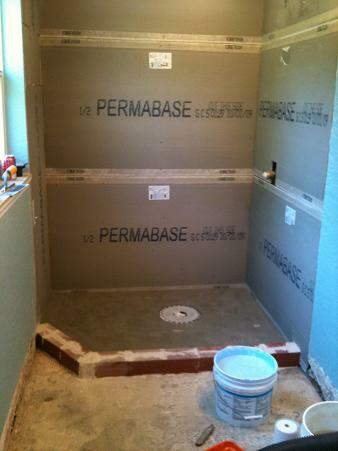 We were able to rip down the tile in panels since the slate was set on drywall. When we got the walls ripped out I noticed there was a liner which had nails through it at the bottom and also all over the curb and there were finger roots from a nearby tree. We ripped out the mud bed which was saturated with water and after seeing the drain that had the weep holes clogged and also the drain itself almost totally closed up with mineral deposits, I could see why. 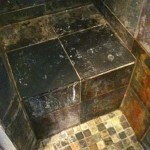 The seat in the shower was even worse. 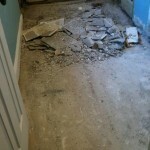 They must have built it prior to doing the mud bed and water was pooling under it with rot and mold all over. There was also no waterproofing on the seat and I could tell by the newer studs sistering the old ones that the shower was remodeled recently. 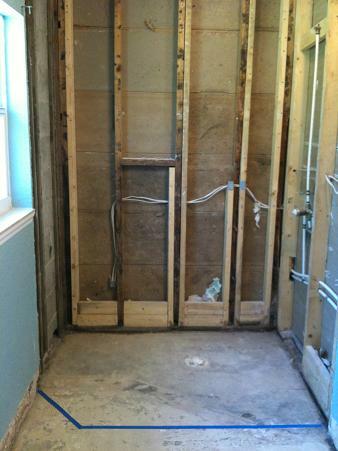 You can see the rip out pictures of the moldy mess HERE. 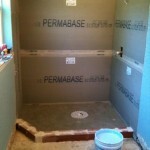 Once the demo was out of the way we started with the block curb build and the cement board installation on the wall. 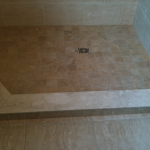 We also installed a Schluter Kerdi drain prior to doing the pitched mud bed. 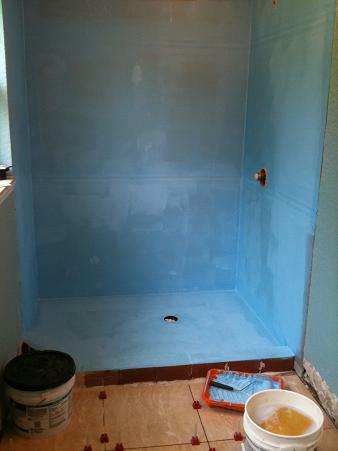 The next day when that was dry, we started applying the Laticrete HydroBarrier liquid waterproofing on the walls and shower floor. 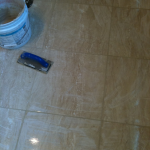 After we did a few coats of waterproofing and it was drying we did floor prep and started setting the 18×18 tile on the main bathroom floor to save time. 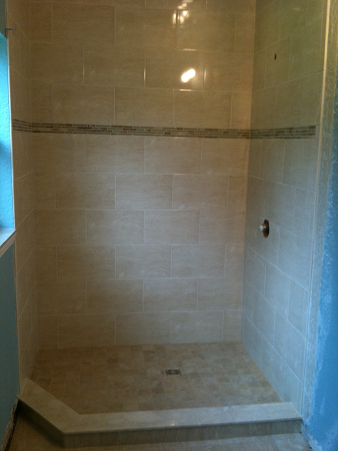 The next day we started to install the shower wall tile in a subway pattern and the glass/marble accent band. 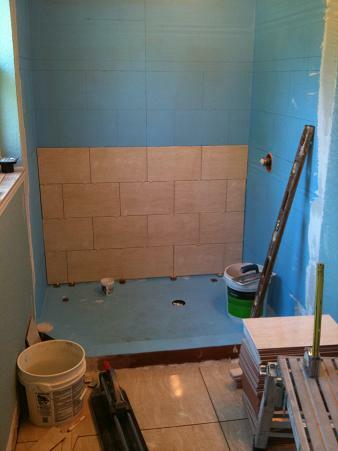 The following day we set the rest of the wall tile, the tile on the curb and set the 3×3 tile on the shower floor. 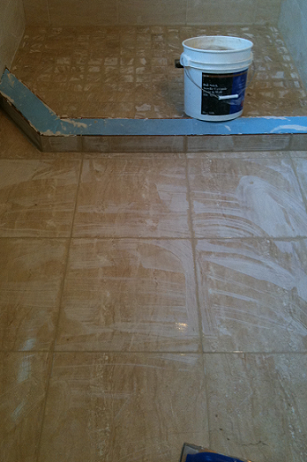 On the last day day we grouted the walls with un-sanded grout and then the shower floor with sanded grout. 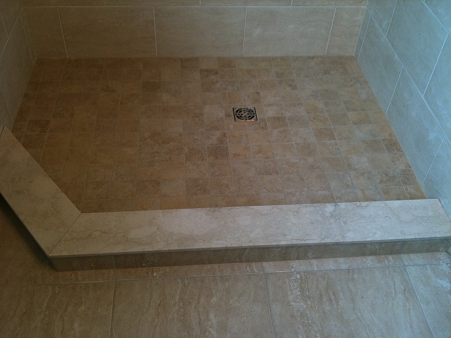 Then we installed the travertine shower sill on the curb and then caulked all corners and did a final wash to complete. 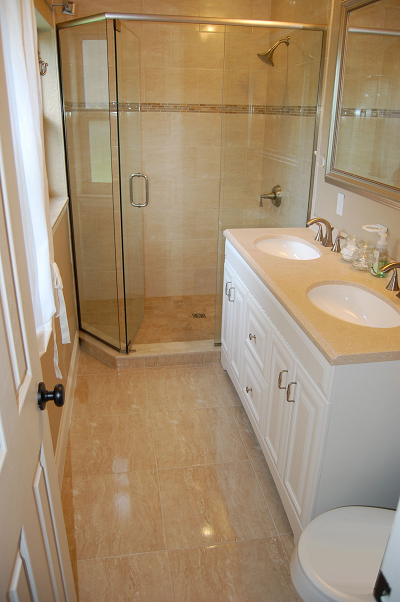 The homeowner had a new glass enclosure installed, a new vanity and also re-painted the room. 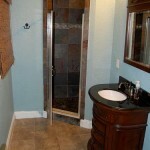 Enjoy the pictures from a Moldy Mess to a Beautiful New Tile Bathroom Shower.